A Great Karoo safari at Mount Camdeboo Game Reserve is a 5-star affair with professional guidance and wonderful creature comforts to enjoy along the way. Guests here set off twice daily on a Great Karoo safari and can also enjoy guided bush walks, Cheetah tracking, stargazing and tours to local attractions. Conferences, weddings and special events can all be held in this rugged yet beautiful reserve. Mount Camdeboo guests are treated to 2 game drives per day (about 3 hours each) at optimal wildlife viewing times in the early morning and at sunset. 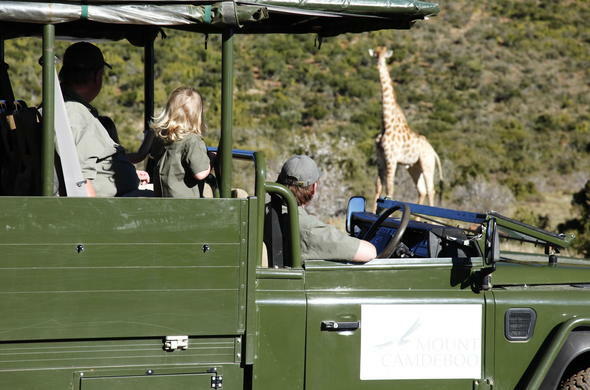 The vehicles used on the reserve are purpose-built, 9-seater game viewing Land Rovers. They are SABS safety approved and equipped with seatbelts, a shade canopy and drink holders. The homesteads are nestled in a valley, and so the game drives typically start with a breathtaking climb up the mountain slopes onto the plateau above, where the animals graze and the world unfolds below. On a Great Karoo safari, guests set off pre-dawn to view game and enjoy delicious home baked muffins, luxury snacks and warm refreshments en-route. In the colder winter morning months guests are also dispatched with hot water bottles, blankets and a dash of liqueur to warm their way. On return to the manors, guests eat a wonderful brunch and then later enjoy high tea followed by a romantic sundowner game drive with nibbles and drinks. On this tranquil reserve, guests can see Cheetah, White Rhino, Cape Buffalo, Giraffe, Mountain Zebra, wild cats, Sable, a host of antelope birds of prey and a unique collection of fauna and flora. The Celebration venue can accommodate up to 200 people in an open barn style or various smaller function rooms. The centre is fully air-conditioned with under floor heating. Mount Camdeboo Game Reserve can host 24 guests while larger parties will be able to find rooms at neighbouring establishments. On site catering (larger groups will require external catering services), kitchen facilities, bar facilities, tables and chairs, sound system, projectors, ADSL Internet access, telephones, video/phone conferencing equipment. The stylish centre accommodates up to 200 people and can be used as one large open-plan room or closed off to create a series of smaller function rooms. Features include under-floor heating, air-con and internet access. This is a National Monument of geological and scenic significance. The sheer cliffs and Dolerite columns rise up 120 metres from the valley floor against a backdrop of the vast Camdeboo plains.